Protect child, the old, the disabled, pet etc. First thing to know: there is no GPS in this one. The location is based on the GSM network and far from as exact as a real GPS device are. Comparing to the http://s.click.aliexpress.com/e/7f6zyue this device is easier to get going with and the setup is easier. You need a SIM card in regular size and if it´s a new card it needs to be activated from a phone before it´s inserted in the device. When you have inserted a SIM card into the device and started it a text must be sent to it ”#711#your cell phone number#0000#1##”. The tracker will reply with ”CONFIG OK” if everything is ok.
6660000 to the SIM card which inside the GPS tracker. you will get the current address location information. 8880000 to the SIM card which inside the GPS tracker.you will get the current address location google map link. The other way is to use the website www.gps588.com, where you log on with the IMEI number of the device. There is an Android app as well, but it´s only in Chinese so I didn´t get it to work. Just as a backup device to a better one. Could be useful if you need information of area position and not exact position. To who do I recommend it? Anyone that already have a GPS device and want a backup one or just need to know area location. GPS Tracking is something that we have seen a lot on the big white screen and it´s always working as a charm. Exact positioning to the meter, instant start and battery capacity for a lifetime. That´s not something you get with low budget tracking device but you could get close enough with a small amount of money. The key selling point with today’s GPS Trackers is child security, elder security and car security. The reason why I bought this one is because I want to keep track of one of my kids. I will in two follow up reviews look at another, even cheaper, device and a iPhone solution. I wanted I device that where not to difficult to handle, with battery time for at least one day and the possibility to update as close to real time as possible. So, the RF-V16 Mini GPS Tracker is really small and the cost is around $50. The size of the unit is 40×34 x14mm and weights 27g. It´s used with a micro-SIM that needs a data plan for the communication. If you use a completely new card (I use a cash prepaid card) you need to do the card activation from a cell phone before using it in the RF-V16. It´s not charged when delivered so I had it connected to a charger over night before starting to use it. The micro-SIM needs to be inserted before the device is turned on and when you do a small melody is played at a rather high volume. The you have flashing leds: one for the GSM and one for the GPS. When its turned on and at least the GSM is flashing rapidly it needs to be configured by SMS. It´s really important that the texts are written in lower case and without any spacing at all. First I had a hard time to get it working because of faulty spacing. The first thing configured is the master number from where all the SMS commands are sent. When that is done we are all set to go. The GPS Tracker could be followed by sending sms, a web page or an Android/IOS app called TrackAnywhere. On the web page and the Android app you logon with the device id and a password. After that I send a SMS with the text ”tim,1#” to get the unit to update it´s position every minute. The frequency of the updates affects the battery time. According to the manual an frequency of 10 minutes will make the battery last 50 hours. I put the unit inside a school bag and when my child leaves with the school bus I start tracking with the Android app or through the web page to make sure that the direction is right. It is possible to set up geo-fences but I think they are a bit limited because the only possibility is to create the as circles. When my child is at the arrival point I send a new SMS text with the command ”tim,20#” which means that the device only updates its position every 20 minutes. Clicking the link takes me to an adapted web page at www.gps123.org. If the battery drops below 10% during the day, a SMS is sent. It´s possible to get some statistics from the device at the web page. I haven´t used it at all but some might have interest in it. There is also a function to playback the route the device did travel..
– Support – where to get it? Yes, it´s a good device that for a small amount of money solves the tracking task with decent quality. I would like a better user interface, but managing with SMS is good enough for my needs. 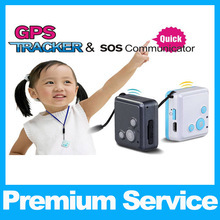 Any parent that needs to have knowledge of where there kids are, this is really a GPS Tracker for kids.